Click image to download the printable checklist directly from Kids for Peace. In cooperation with the United Nation’s International Day of Peace on September 21st, one my favorite nonprofits, Kids for Peace, is challenging all kids to do as many peaceful acts as possible! Kids for Peace has created a free list of peaceful suggestions that makes it very easy and fun for your kids or students to get involved. The acts are accessible for kids of all ages and make enjoyable family and classroom activities. I’ll be joining forces with the kids in my community to spread peace over the next couple of weeks, beginning with a visit to an orphanage in Mexico tomorrow to help out with a fun soccer day. 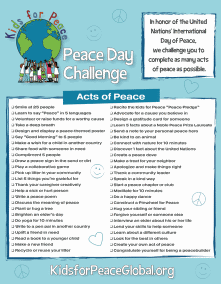 If you’re interested in creating your own fun day of peace, download the checklist here! Be sure to use #PeaceDayChallenge if you share photos of your peace efforts on social media! This entry was posted in Uncategorized and tagged fun activities for kids, international day of peace, kids, Kids for Peace, peace day, peace day challenge, united nations on September 11, 2015 by admin.